Traditional Catholic Musings: Father Patrick de la Rocque on a proposed deal. Father Patrick de la Rocque on a proposed deal. As a result, without venturing into satire, it would be indispensable to question Pope Francis on the content of his Faith, before even considering if a canonical recognition were opportune or prudent. Because the Divine Will cannot require us to place our eternal salvation in the hands of someone who does not profess the Catholic Faith. To establish legal unity without real unity would, incidentally, be contradictory. This is undoubtedly what Archbishop Lefebvre had in mind when he said in Fideliter magazine after the 1988 episcopal consecrations: “If I live a little longer and, supposing that in some time from now Rome calls me, [..] I would raise the question to the doctrinal level: 'Are you in agreement with the great encyclicals of all the Popes who have preceded you? Are you in agreement with Quanta Cura of Pius IX, Immortale Dei and Libertas of Leo XIII, Pascendi of Pius X, Quas Primas of Pius XI, Humani Generis of Pius XII? Are you in full communion with these Popes and with their affirmations?' [...] The positions would thus be clearer”. 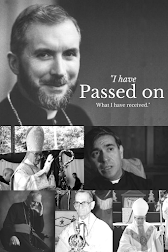 Who is the true follower of Archbishop Lefebvre? Magnificat Media call it right again.